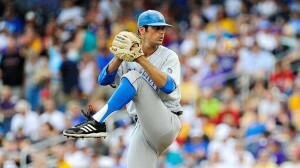 The UCLA Bruins may not be the best team in the College World Series, but they sure played like it on Sunday evening, upstaging the number four ranked LSU Tigers 2-1 in game four of the opening round in Omaha. The story of the game was the rubber match between staff aces, UCLA’s Adam Plutko and LSU’s Aaron Nola, both of whom pitched masterfully on Sunday. Plutko went seven strong innings, surrendering one run on four hits while striking out two batters and walking two. Plutko has been the definition of stoicism this season, possessing great poise and mound presence, both of which he effectively employed throughout the game. The Bruins ace mixed his fastball and off-speed offerings well, pitching up in the zone as he typically does to force a fair amount of flyouts, in which he induced six flyouts and four pop outs across his seven innings of work. In all, Plutko was impressive in holding one of the premier offenses in college baseball in line and to limited production. As for Nola, the Tigers ace was strong as usual, showcasing a low-90s fastball that worked the zone with solid movement and an off-speed arsenal that kept a number of UCLA batters off balanced. In three starts this postseason, Nola has allowed seven runs, all of which have been unearned. A typically air-tight defense has not supported Nola throughout postseason play, although such does not take away from the strong performances being put up by Nola, who is shaping up to become a sure-fire first round draft pick in the 2014 MLB Draft. Following a quiet first three innings, the Tigers struck first on a solo home run by Mason Katz in the fourth inning, giving LSU the early 1-0 lead. UCLA would strike back in the top of the sixth on a sacrifice fly by Eric Filia, scoring Brian Carroll and tying the game at 1-1. Both teams would cruise until the top of the eighth, wherein Eric Filia would reach on a mishandled grounder to short by Alex Bregman, scoring Christoph Bono to give the Bruins the go-ahead run and 2-1 lead. James Kapriellian would relieve Plutko to pitch a scoreless eighth, who would hand off the ball to closer David Berg in the ninth. Despite a surrendering a walk to Christian Ibarra and a base hit to Tyler Moore, David Berg would work his way out of the jam and get JaCoby Jones to fly out to right to end the game, cementing the victory for the Bruins. With the victory, the Bruins will face the NC State Wolfpack on Tuesday, while the Tigers will face the North Carolina Tar Heels in Tuesday’s losers bracket game.